This carving was completed last month but I didn't get a decent photograph until this weekend. 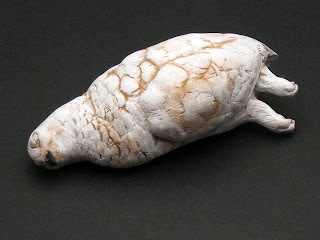 It's depicting a dead ptarmigan and was created for an online exhibit to open shortly. It measures just over 3 inches in length and is carved from boxwood, with a light scumbling of paint made from animal glue and gofun. I had a tought time with the finish on this one- I really liked the bare wood, especially in a soft light where the volume of the body and the feathers showed to an advantage. A recent trip to New York and an exhibit at the Japan Society changed my mind. There were several basketry pieces coated in rough mixtures of gofun, ash, sumi and clay. The tactility and coarseness attracted me and I left thinking I'd like to explore more in this vein. At any rate, after three trial coatings and subsequent strippings, I settled on this wash of paint that was dabbled on. It gives a nice soft effect- absorbing light and adding a satifying feel in the hand. The paint forms a sort of crust on the high points of the carving and suggests fleeting life inside. I finished this piece recently. 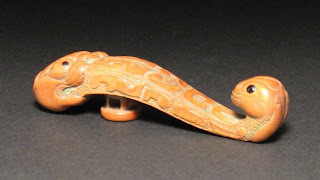 It's in the shape of a Chinese belt hook- an accessory used in ancient times to fasten one's belt or cloak. The stud on the base would fit into a hole or slit in the belt, and the curved hook part would latch to the other side. They were made out of bronze, iron or stone; typically jade. They run the spectrum from ornately gilt and inlaid pieces, to ones that seem to be purely functional. Wanting to develop a narrative with this piece, I chose a cat-like beast on one end with rabbit or hare on the other. It measures 3 1/4 in. 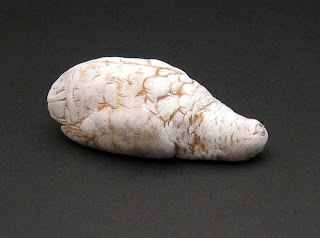 (8 cm) long and is carved from mountain mahogany, with a light wash of verdigris pigment to suggest some age and patina. There's a small elastic cord than runs up internal cord channels and joins at the top of the case. The upper portion lifts as a lid and then fits back into place with the retention of the cord. There aren't stacking compartments in this one (hey, it's under 6 bucks) but it will fit money and a set of keys. 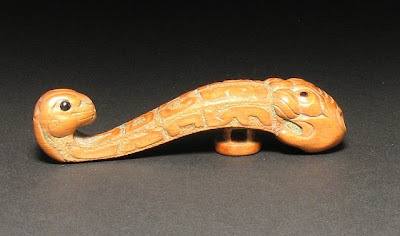 The neck cord is also the perfect thickness to fit into the himotoshi of a netsuke, for suspension from your belt. There are business card holders and mp3 player cases in the Bungee line too. Autumn might be still on the calendar, but Winter brought a chilly 6 degrees F this morning. 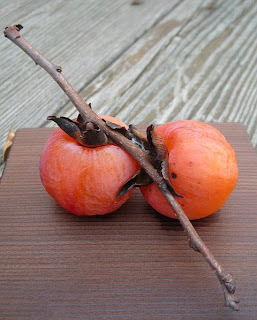 The picture above was taken a few weeks back when there were still plenty of plump, sweet persimmons in the trees. The few that remain now look like neglected Christmas ornaments on a twiggy bough. I haven't posted anything since July- not because I haven't been working and creating things, but I just haven't been happy with the quality of the photographs. The more I think about it, it seems like these days with ease of photo sharing online, the picture has almost become the surrogate for the object shown. Artists are finding new ways of marketing themselves. Dealers and collectors are able to discover new works, giving them a taste before arranging to see the actual items and purchasing. My carvings are appreciated by those who purchase them, but without a successful photo there's a trap I fall in to thinking the item hasn't be legitimatized. A photograph can never capture the reality of the piece, especially an intimate carving, yet it's the standard by which artworks are often judged these days. There are exquisite works of art from the past and present which will never appear online. Don't forget we see with our fingers and noses as much as our eyes. Get out there and see some work in person. Give it a caress and a sniff. Stay tuned... I've got three works in the final stages right now and a friend with a camera dropping by. We'll try to capture something.